The famous Kimberley Cooking Schools at the acclaimed wilderness retreat Faraway Bay happen later this month. Due to popular demand, for the first time Faraway Bay is staging two cooking schools back to back – May 26-29 and May 30 – June 2. Faraway Bay owner Robyn Ellison said it was great to see Chris Taylor return for his eighth year leading the event. "Chris has a wonderfully laid back style and really interacts with the guests, who love learning from such a master chef," said Robyn. "It's a great opportunity for guests to pick up tips and tricks from one of Australia's best chefs, in the most amazing location," she said. Chris Taylor said he was looking forward to the event. "The Kimberley Cooking School is a unique Australian dining and gourmet experience," said Chris. "The view from the kitchen out over the bay is amazing – for a chef it doesn't get any better than that," he said. "It's also great to be part of that hunter-gather experience where you catch superb fish like Spanish Mackerel or Mangrove Jack, then learn how to cook it." The Kimberley Cooking School was recently rated Western Australia's Best Gourmet Experience by Australian Traveller Magazine. 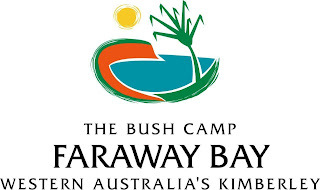 The Kimberley Cooking Schools compliment Faraway Bay's other acclaimed food events including the Pete Evans Celebrity Cooking School in October, and the Bush Tucker and Camp Oven Cooking Schools in April and August. - Sightseeing and excursions during the day including boating to the magnificent twin falls on the King George River, fishing, exploring ancient rock art and more. The Cooking Schools are open to 12 fortunate guests only and space is strictly limited. Prices start from $3,710 per person. For more information ph 08 9169 1214. The Kimberley Cooking School is proudly sponsored by Skywest Airlines.